most interesting aspect of this partial cover is the postmark which celebrates DNI KSIAZKI or Book Week in Woldenberg Oflag IIC, the German World War II prisoner of war camp for Polish officers. Book Week in the camp took place from August 29 to September 4, 1943 to celebrate the 400th anniversary of the printing of the first Polish book. An exhibit at the library was organized by the the Council for the Camp's Library for Cultural Instructions. This item was given to me by my friend and fellow bibliophilatelist Jerzy Duda of Krakow Poland who also first alerted me to the story which this cover helps tell. 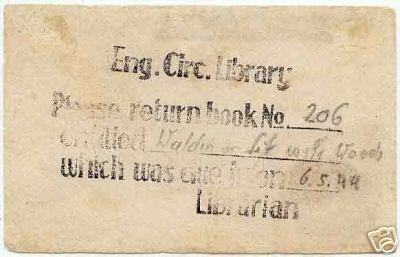 The cover is a perfect example of postal librariana because it has both a library history story and a postal history story. Roman Sobus is an expert on the postal history of the camp and has developed an outstanding exhibit on this topic. 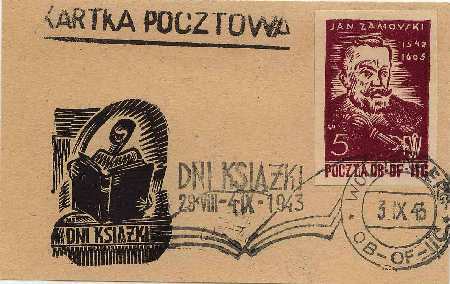 as Sobus points out in the introduction to his exhibit the postage stamps and special postmarks that were created by the Polish prisoners of war "are most often of a strong cultural or religious nature, depicting events or persons from Poland's history, and its battles for independence, a fact seemingly lost on the prisoners' captors." For more on this and other similar covers click here. Image on the reverse of the cover above. 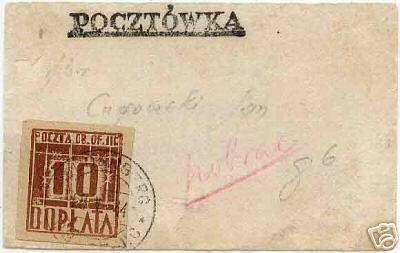 The postal items from Oflag IIC, Wodenberg below are reproduced with the permission of Roman A. Sobus. His exhibit entitled "Internal Camp Post between 1942-1945 at Offizierlager IIC - Woldenberg" was shown at the 2007 CHICAGOPEX stamp show in Chicago and received a Gold Medal. To view Roman's exhibit online click here. 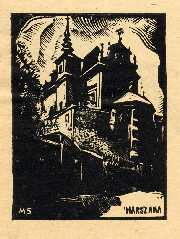 A variation of the postmark to celebrate the 400th anniversary of the printed book in Poland. 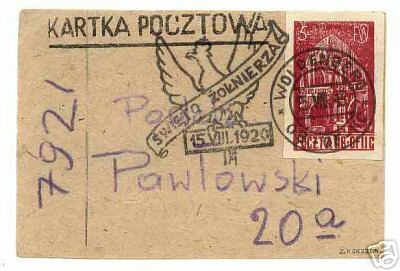 Poland, Internal Camp post card from Oflag IIC, Woldenberg, Post card sent from the camp's English Circulating Library, mailed without postage, added 10f due stamp. Red pencil notation "pobrac" (collect). Poland, Internal Camp post card from Oflag IIC, Woldenberg, Post card sent from one of the camp's libraries, franked with a stamp from the Copernicus issues, and Soldiers Day cancel. Click here to see the Wikepedia entry on Oflag IIC.